It is the most significant celebration in the Polish calendar. The term “wigilia” comes from the Latin word “vigilare,” to watch. The evening is filled with expectation and symbols of faith and culture. Cooking begins days before with the making of breads, cookies, soup stock, pickled herring and pierogi — savory filled dumplings. The foods are meatless, following the old tradition of abstinence from meat on the eve before a major feast. “Wigilia” begins with the children looking out into the eastern sky for the first star of the evening. When it is spotted, the patriarch of the family starts with a blessing and hands out “oplatki,” wafers imprinted with scenes from the birth of Christ and the Holy Family. Each person takes a wafer and exchanges good wishes with every other person at the gathering, breaking off a piece of “oplatki” with each wish. The meal courses follow and can vary in number and type depending on family practice and Polish origin. Our family starts with a hearty, fresh mushroom soup and the “plecionka.” The special soup is made from scratch and only this one time each year. Usually my father is served the soup first and we wait for his taste and ruling on it. Then everyone else digs in. There are generally no culinary surprises at the “wigilia” table. The next course is pickled herring and plain boiled potatoes, followed by baked or grilled fish, pierogi, mashed potatoes and a vegetable. Last, sweet breads, traditionally made with fruit or poppy seed, an assortment of cookies, warm fruit compote and coffee are served. The “wigilia” meal is lengthy but not extravagant. It’s to remind those taking part of the humble roots of Christ’s birth. It’s also customary to place a piece of hay under the tablecloth and to set an extra place for a stranger. I asked my mother why “wigilia” is so important to Polish people. She gave me this glance, as if I should already know, and I do, but wanted her to say for herself. Sprinkle yeast into water and let stand 5 minutes. Dissolve sugar and salt in the potato water in a stand mixer fitted with dough hook. Add eggs, yeast mixture, butter and potatoes. Blend well after each addition. Add half the flour and beat with mixer until smooth. Add remaining flour gradually. Continue to mix. Remove dough and knead slightly on floured surface. Turn dough into a buttered bowl. Sprinkle lightly with flour and cover with wax paper and damp cloth. Refrigerate dough overnight. Punch the dough down as it rises. Remove dough from refrigerator for 10 minutes. Divide dough into three even pieces. Divide each piece into three and roll each piece into a rope. Braid three ropes into a loaf. Repeat to make three loaves. 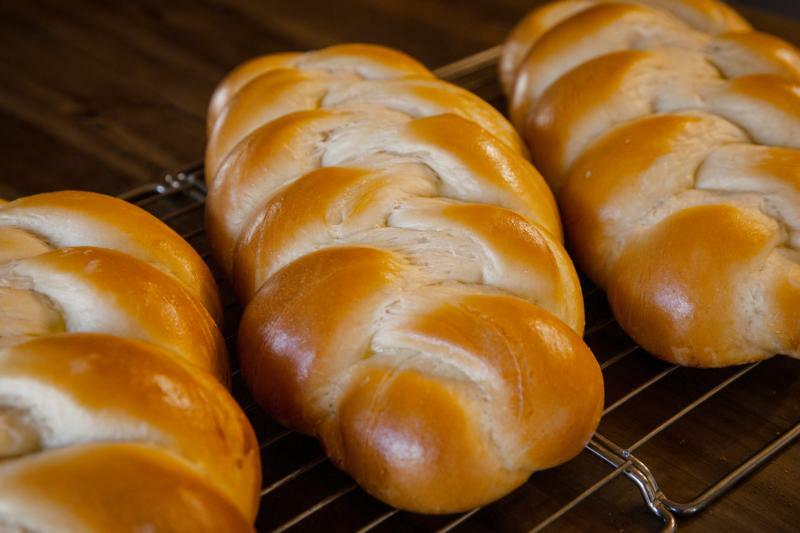 Place each braided loaf on greased or parchment-lined cookie sheet. Cover the loaves with a dry cloth and let rise for an hour and a half, until light and puffy. In a small bowl, whisk the egg and add the milk. Brush loaves with the egg wash.
Bake loaves for 20-25 minutes. Cool on racks. Slice and serve with butter.